Last year we introduced you to our newest project car, called simply "Project Boxster Clubsport". In that first installment we found the right car, we purchased it for a song, and it was sitting politely in our garage waiting for its first modifications. So far, the Boxster has been happy to simply rack up the miles and keep things rocking along. It's an excellent Porsche, and we aim to make it just a little bit more excellent with each improvement. Our Boxster has lost a good chunk of weight, and it's looking a bit better. That's all well and good, but part of the "clubsport" ethos is to make the car more engaging to drive. The first step we make in that department is to install a short shift kit. Read on to see how it went. The first decision to be made was which short shift kit do I buy? There are so many options out there, as all of the shifters are the same from 986 and 996 through the end of 987 and 997, meaning there are even a few factory-fitted options. If you want OEM design, 986 and 996 owners can upgrade to the slightly shorter 997 version, the 997 GT3 version (which is the same but with metal bushings), or the 'factory 997 short shift kit' which is shorter still. If you prefer aftermarket, the two main options are available from B&M and Agency Power. How did I make my choice? Well, I find myself constantly perusing the listings over on Rennlist for performance bargains and such. When I found out I'd be in the San Francisco area, I pulled up the parts listings for Porsche goodies. Lo and behold, there was a listing for an Agency Power short shift kit with our car's name all over it in the Bay Area. It didn't hurt that the listing was for a quite reasonable $250! When taking into consideration that the original MSRP of this setup directly from AP is $380 plus shipping and tax, I knew it was the bargain our project was looking for. A couple of days later, I met up with the guy (who had sold his 996 in order to get a beautiful 993) and traded dollars for short throw shifts. I love it when a plan comes together. The best part about buying used was that the previous owner had purchased a second shift console to use for their short shift kit, meaning the kit came all assembled in a stock plastic shift console. That made installation just a breeze, and increased the value of our purchase even further. It was the bargain of a lifetime. Alright, that might be a slight exaggeration, but it was still a pretty good deal. Porsche guys are always easy to work with, and in this case it couldn't be more true. So, how easy was the install? 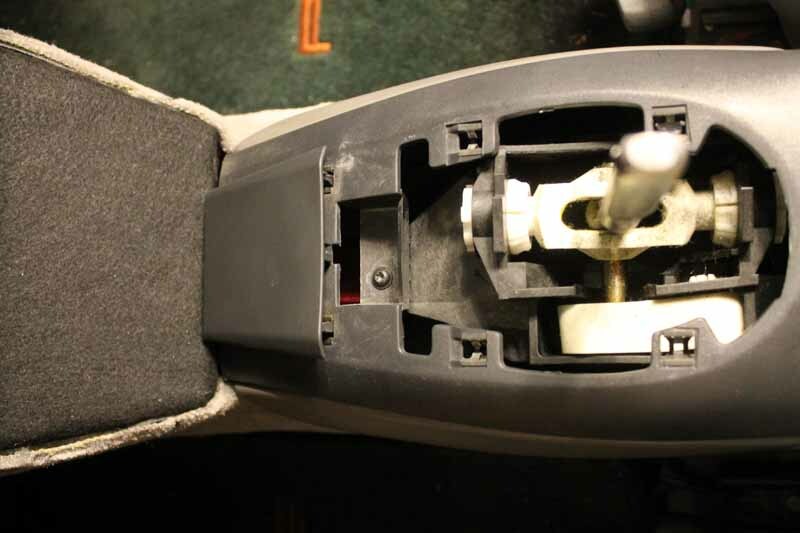 The first step of installing a short shifter is always to remove the center console. 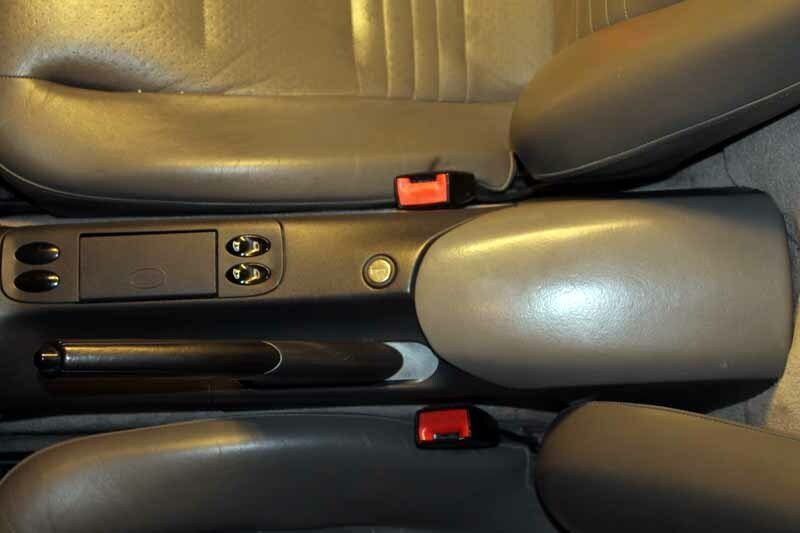 There are screws in the ashtray, two in the bottom of the center console, and one underneath the 'coin holder' inside the center console, and there is another one holding the front to the car under the shift boot. It's always handy to have your "101 Projects " book or a Bentley manual around to walk you through the process, but it's a project that pretty much anyone should be able to tackle on their own. In the above photo, you can see the center console storage box with the false floor removed, and the coin holder removed. This is the interim step to getting the center console removed from the car. The whole thing comes out as a single assembly, so make sure you work carefully to not break anything. Once everything is unfastened, moving the whole assembly forward and up to clear the parking brake is the important part. From there, until reinstallation, everything else is pretty straightforward. 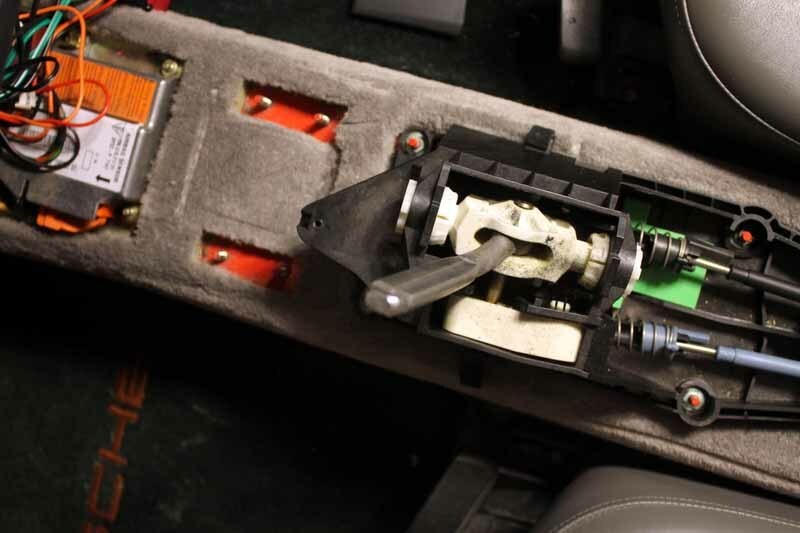 The shift boot simply lifts up from the center console with four clips. Be very careful, as the retaining ring of the boot can be very brittle with age and it can be pretty easy to break off a tab in the removal phase. We know this from experience, as our shift boot is now a bit loose with one of the tabs missing. Take care and you should be alright. If you do break one, however, you can get new retaining rings separate from the boot material and simply re-wrap your boot around the new ring. This will probably be our next course of action, unfortunately. Once the base is separated from the console, the knob can be pulled upward to slide off of the shift shaft. Once fully removed, you can get the final screw out of the console assembly. With everything pulled up and away, you can finally get a good look at your shift console with the old shifter assembly in there. You can clearly see the four posts that hold this assembly to the car, and the two shifter cables coming out of the console that control all of your shifting action. It's actually a pretty genius system if you think about it. The stock shifter feel isn't too bad, but the throws are a bit on the long side. It's about time we fixed that. An important part of this installation that you want to make 100% sure you don't skip is to mark where the cables are installed into the shifter. Mark the cable end at the base of both plastic connectors before removing them. This will make cable adjustment so much easier when you put the new short shifter in your Porsche. 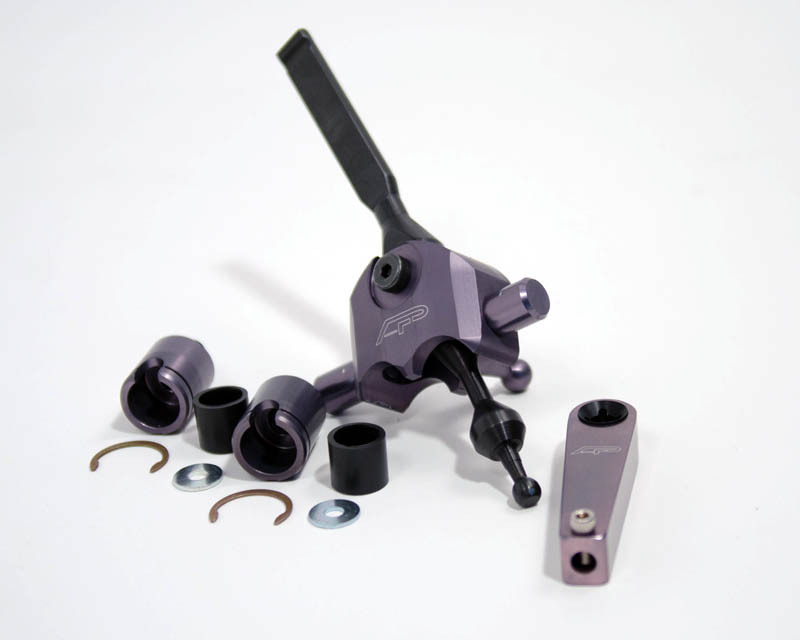 Once your new shifter is installed in the stock shift base, installation is very simple. At the risk of sounding like a Haynes manual, installation of the center console is opposite of removal. Simply re-do everything you undid and you'll be back to working order and driving in no time. Once installed, none of this will be visible, but the quality of the piece is nice to look at before covering it all up. I don't have a lot of experience with the B&M piece, but I imagine it's quite similar. The stock 'short shift' is essentially the same shifter that was stock in all GT3 RS cars, so I'm relatively familiar with that one. I like it, to be sure, but I think this Agency Power shifter is a step above anything that came 'stock' from the factory. We've had this shifter in our Project Boxster for a while now, and we really like the chunkiness and weighty feel of the shift. Before the swap, the shifter felt a bit more vague and less deliberate. It was easier to slide the shifter between gears, but it was also more difficult to determine which gear you were in by feel. The new shifter feels almost as though it has a 'gated' feel to it. On top of that, the shifts are a lot shorter, as the name would suggest. We only have to move the shifter a few inches, whereas before the shifter felt like it was moving at least 6 inches from front to back (say a 3rd to 4th upshift). It is difficult to describe, but the shifting feels more defined and engaging. Does this upgrade make any actual performance difference to the car? No, not really. The car is no faster, no lighter, and hasn't gained any lateral grip, but it does *feel* sportier, and perception is often just as important as reality. What are your thoughts? Is a sportier feel worth the extra effort? Short Shift Kit Installation Weight Loss Total - Negligible. Perhaps a few ounces. Which Porsche Will Become “Collectible” Next? I’m disappointed you didn’t cover the shift cables disconnect/reconnect. You implied it was very important then you skipped it altogether. Trying to replace center console locking mechanism on 2003 996. Unable to extract coin holder to get to screw supposedly thereunder. How to extract coin holder? There appears to be a tab at bottom but pushing and prying to no avail. Any suggestions short of breaking it?